Start 9:00 am. It will be at Raman's house in the Evergreen area of San Jose. The largest cross street is Aborn Road. 3692 Rose Terrace Circle, San Jose 95148. Raman has kid duty at noon. 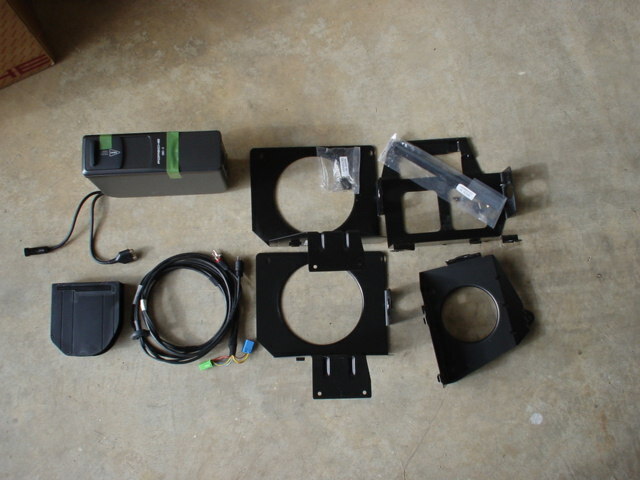 We will finish a TrafficPro install, put in a cd changer, and maybe a rear speaker kit. Ooops. Rose Terrasse Circle. That is why you cannot find Terrace on the maps. So the deed is almost done. Reverse wire for the TrafficPro is hooked up. Before we take a car apart we check to make sure we have the correct parts. Pat bought the factory cd changer kit and included in the kit is the mounting brackets for all Porsche models, LHD and RHD. C4 changer bracket is different than a C2/Boxster. RHD bracket is different than a LHD bracket. You use the bracket you need which is included in the kit and throw the rest of them away. When I looked at the parts I saw the dealer sent two identical brackets for a right hand drive Boxster/C2, instead of one bracket for a LHD and one bracket for a RHD. So someone in the UK has two LHD brackets, and Pat has two RHD brackets. We went forward and installed the changer and it works fine other than it is not mounted on a bracket. So if anyone needs a bracket for a RHD car I know where you can find two of them.